Download this tip sheet from uKnowKids and share it with your teens and tweens. It will help them navigate their digital world and give you peace of mind! Think before you post. If it takes you longer than 3 seconds to determine if it is appropriate or not, it is better to not post it at all! 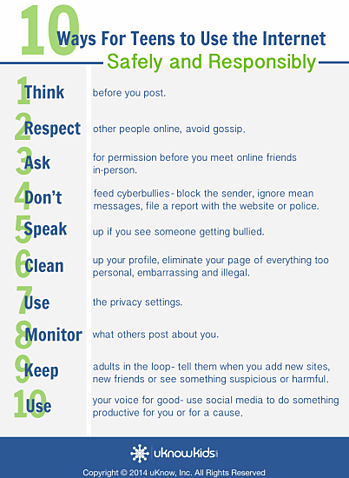 Respect other people online and avoid gossiping. Ask for permission before you meet online friends in person. Don't feed the cyberbullies. Block the sender, ignore the message, or file a report with the website or police. View now for the full list of tips! View This Tip Sheet Now!